What would you guess is the fastest growing segment of Amazon’s many businesses? Grocery? Voice technology? Television? All would be good guesses, but the correct answer is actually advertising. Current numbers have Amazon’s advertising segment projected to earn between $4 and $5 billion in 2018, outpacing even optimistic estimates for the business from the start of the year. This growth of 132% from 2017 makes it Amazon’s fastest-growing segment by a significant margin. Amazon is a force, unlike anything the retail world has ever seen. Over 100 million people have paid Amazon Prime accounts, with hundreds of millions more using free accounts. Only Amazon could create an international shopping holiday so effective that it annually shatters its own sales records. For brands that sell on Amazon, advertising to increase visibility and sales on the site is a no-brainer. But brands that want to successfully advertise with Amazon need a solid strategy. Amazon Advertising and Amazon DSP are distinctly different in their implementation and reach. When used together strategically, Amazon Advertising and Amazon DSP can create a comprehensive advertising solution. Amazon Advertising is the most well-known search advertising option for brands selling on Amazon, with its ads appearing directly on the site within search results and on product pages. This pay-per-click (PPC) search marketing platform offers three different ad types: Sponsored Products, Sponsored Brands, and Product Display Ads. Brands can use targeted keywords to put their advertisements in front of people who are the most likely to buy, boosting traffic to product pages and increasing sales velocity. How Does Amazon DSP Work? Amazon DSP ads don’t appear on amazon.com but instead are served to Amazon’s collection of owned online properties as well as mobile users on Android, Kindle Fire, and iOS platforms. These display ads use a variety of remarketing strategies to retarget customers who looked at Amazon pages but didn’t buy, customers who were researching products on brand websites, and even people looking at competitor’s products on Amazon. Display ads can use images and information from Amazon product pages to draw in customers browsing other websites who weren’t actively shopping, catching their attention and rerouting them back to a sale. Amazon Advertising and Amazon DSP are both effective when used alone, but when combined, the two services complement each other’s strengths and help cover the other’s weaknesses. Imagine that your advertisements are actively “looking” for potential customers. Amazon search ads are like a microscope, letting them look for likely buyers on a focused, granular scale. These potential customers are already located at the point of sale on Amazon, at the bottom of the sales funnel. By using targeted keywords, your Amazon search ads can zoom past hundreds of millions of uninterested buyers to locate exactly who they’re looking for, like finding a needle in a haystack. Using the same analogy, Amazon display ads are like binoculars. You know that potential customers exist outside of Amazon, but that area is vast. Display ads let you survey broad swaths of the web to find unassuming potential customers on different sites. These potential customers exist higher up on the sales funnel but just might come around for a sale if they’re reminded of something they didn’t buy earlier. Because search and display ad types operate so differently, they gauge success using different metrics. Amazon search ads tend to have lower impressions, but higher conversion and CPC rates since they appear so close to the point of sale. Amazon display ads have higher impressions but much lower conversion rates and are so broadly disseminated that brands are charged by every thousand impressions (CPM) instead of by clicks. Harnessing this yin and yang of granular and broad search marketing is essential for any well-rounded Amazon advertising strategy. 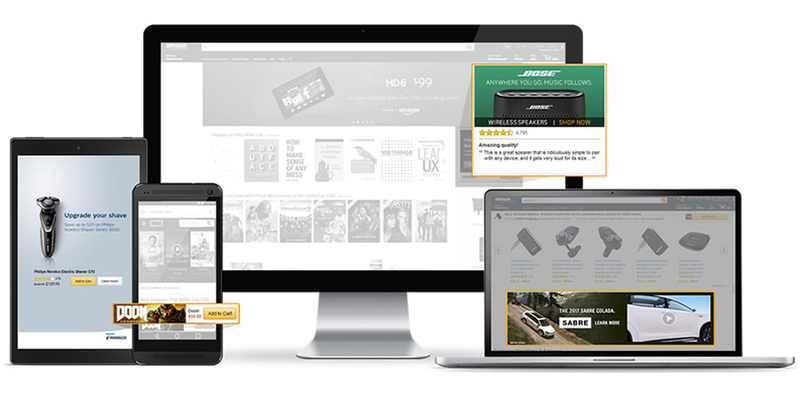 Companies looking to reach the largest number of potential customers need to be aligned with an agency that fundamentally understands how Amazon search and display ads are used in tandem for maximum efficacy. Unlike Amazon Advertising, which brands can use self-service to create, modify, and track their advertising campaigns, Amazon DSP campaigns can only be managed by Amazon or by agencies that have been certified in the platform. Amazon Advertising and Amazon DSP are both arms of the same advertising body, and choosing an agency that can manage both platforms congruently will lead to the best results. Brands that don’t adopt a holistic approach to Amazon advertising are going to be left playing catch up. Editor’s Note: On September 5, 2018, Amazon rebranded its advertising platform. Amazon Marketing Services changed to Amazon Advertising and Amazon Advertising Platform changed to Amazon DSP, among other changes. This blog post was changed on October 10, 2018 to reflect those changes.